Private Lee started performing music professionally and teaching 5 string banjo in his early teens. By this time he was already able to play the piano, organ, accordion, cornet, bass clarinet, mandolin, guitar, and the 5 string banjo. As time progressed, so did the amount of instruments that Private Lee added to his arsenal. He now performs 22 different musical instruments, including the acoustic and electric bass, electric guitar, synthesizer, guitarron (mexican acoustic bass), various percussion instrument and also sings. 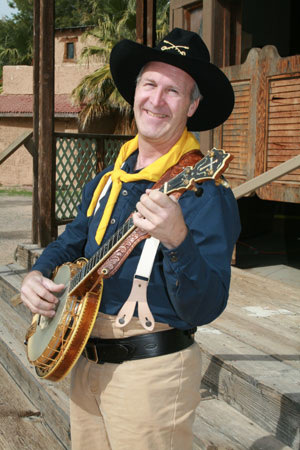 His first professional job at 16 years old was performing with a bluegrass quartet, the Smoggy Mountain Bluegrass Band at Legend City amusement park in Phoenix Arizona. He has been in pit orchestras for many professional and non-professional musicals and has also performed at the Lincoln Center in Washington D.C. with Scottsdale Community College for their production of WORKING. He performed at Rawhide Western Town in Scottsdale, with the Night Riders, and still performs with the Steve Barker Band at the relocated Rawhide Steakhouse at the Wild Horse Pass. Private Lee’s present trail ride with Pioneer Pepper & The Sunset Pioneers, started in the summer of 2008, when he was asked to fill in for a 2 month dinner show series. Pioneer Pepper hired him on permanently, when he recognized not only his musical talent, but also his friendly stage presence, and dedication to showmanship. Private Lee has been riding the trail with The Sunset Pioneers ever since. Private Lee attended Arcadia High School in Phoenix, Az. He received his AA degree from Scottsdale Community College, his Bachelors Degree in Jazz Performance on String Bass from Arizona State University, his Post-Bac music K-12 teaching certification also from Arizona State University, his Masters in Elementary Education with Reading Endorsement from Northern Arizona University, and recently became Arizona Elementary Classroom certified K-8. He currently teaches band at Kiva and Pueblo Elementary schools in Scottsdale Arizona, since 1993.